Balanced Flue Hole in the Wall Gas Fires There are 76 products. Gas Fire Gazco Eclipse Verve XS, High Efficiency (82%) Glass fronted Balanced Flue Gas Fire. Gas Fire Gazco Eclipse Icon XS, High Efficiency (82%) Glass fronted Balanced Flue Gas Fire. 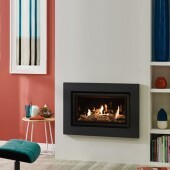 Gas Fire Gazco Eclipse Expression, High Efficiency (82%) Glass fronted Balanced Flue Gas Fire. 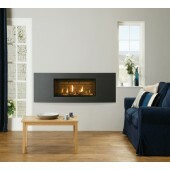 Gas Fire Gazco Eclipse Edge, High Efficiency (82%) Glass fronted Balanced Flue Gas Fire. Gas Fire Yeoman CL670 Balanced Flue , High Efficiency (76%) Glass Fronted Cassette Balanced Flue Gas Fire. 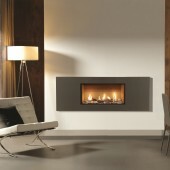 Gas Fire Gazco Studio 1 Profil Balanced Flue , High Efficiency (92%), 5.2kw Balanced Flue Gas Fire. GS1bf The Studio Profil gas fire features ultra contemporary styling that fits in perfectly with all modern interiors. Furthermore, the Studio Profil offers you two stunning frame choices and is available on all sizes and fuel types of Studio fires. The Studio Steel gas fire is for those with large spaces who wish to create a greater presence with their choice of fireplace. The Studio Steel’s wide frame instantly creates a distinctive and individual focal point.Operation is simplicity itself too, as Gazco’s Sequential remote control takes care of everything from ignition to flame height adjustment.